On Friday, 21 Sep. 2012, ten scouts from Troop 122 took part in the National POW MIA Recognition Day ceremonies at Veterans of Foreign Wars (VFW) Post 2179 commanded by Will Purcell. 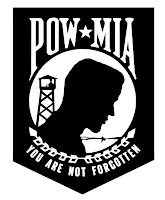 This is is the only day specifically set aside to remember the Prisoners of War (POW) and those still Missing In Action (MIA). I cannot tell you the effect the presence of our scouts had on everyone at the VFW hall. Most of the people who attended were middle aged or older but this year, there were 10 boys, sitting in the front row watching as our nation remembered the sacrifices of their sons and daughters. To many people, myself included, this meant that memories of their sons, daughters, personal sacrifices, and sacrifices of their loved one will last for many more generations. One moment especially rich with emotion came when one of the Gold Star Mothers (mothers who lost a child in the service of our country) spoke to the crowd. She focused her gaze and words almost entirely on our Boy Scouts - who were probably only 6 to 8 years younger than her son was the last time she saw him. So, thanks to all of the parents who brought their sons out to the VFW to be there. I can tell you that their presence was significant and touched many hearts. Matt Yesalonis, Patrick Twomey. Not shown: Evan Crowell, Michael Butler, and Jack Purcell. 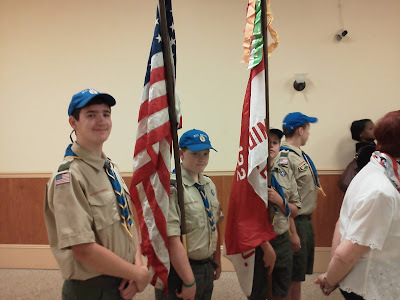 The troop provided a color guard which consisted of Dan Gruspier (right guard), Michael Butler (US Flag), Atom Chaney (Troop flag), and Joe Davis (left guard). They were organized by Asst. Senior Patrol Leader, Evan Crowell.